There is only one thing better than owning a Jeep —and that’s Jeep modifications and accessories! What can we say? It’s a Jeep thing. Once you become a Jeep owner you become part of the Jeep culture. This includes the very exclusive Jeep wave. 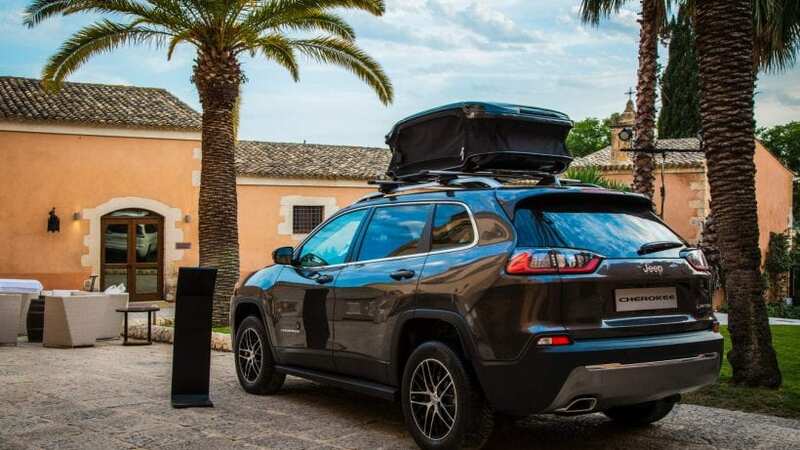 But, whether you’re a first time Jeep owner or you’ve collected them your whole life, part of the fun is what you can add (or subtract) from your ride. If you’re a newbie, don’t worry because we’ve got you covered. 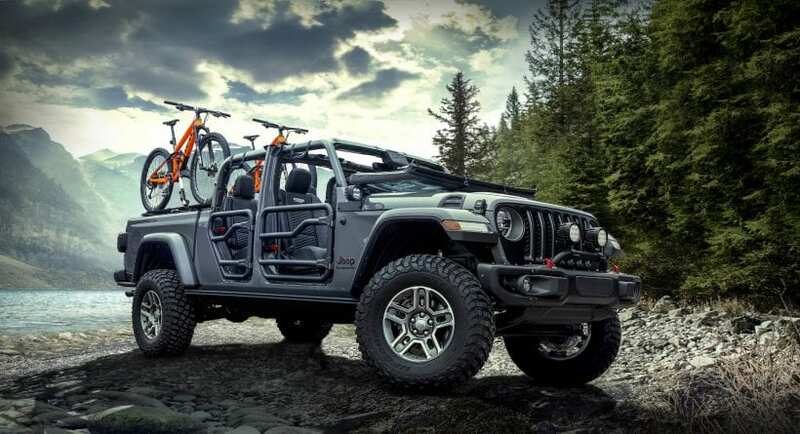 We have cultivated a list of the 8 best Jeep accessories. WARNING: Once you go Jeep, there’s no turning back. 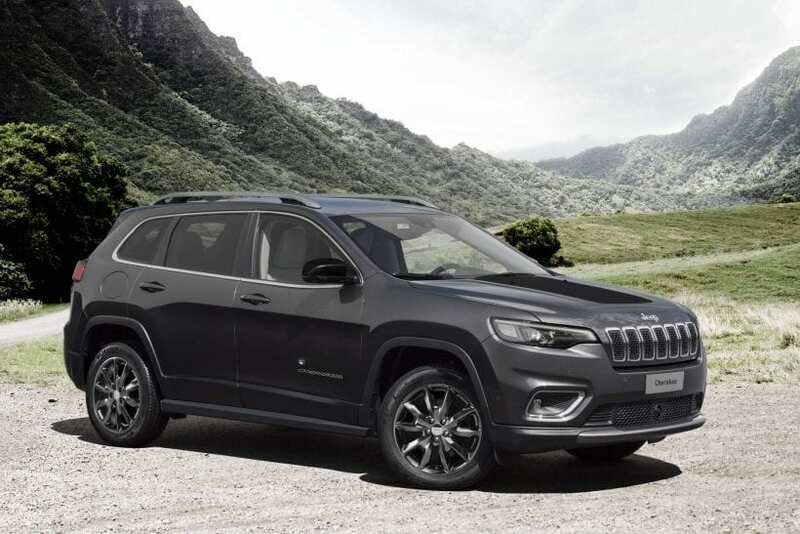 No matter how much you love the cars you drive in the future, there will always be a Jeep-shaped hole in your heart. —Unless of course, you fill it with another Jeep! Once you see all of the possibilities, it’ll be hard to resist keeping your Jeep stock. Especially if you’re an off-road enthusiast. Aside from whipping around in the mud, one of the best ways to christen your Jeep is to lift it. Options range from 2″ budget spacers to 6″ suspension lift kits and beyond. There’s a size and a budget for every Jeeper out there. Of course, how high you go depends on how adventurous you plan on getting. Remember, the higher the lift the more intensive the labor (and costs). If this is your first lift, you’ll want to stay under 3.5″. This way, you won’t have to worry about extra parts, brake line relocation, and the notorious death wobble. 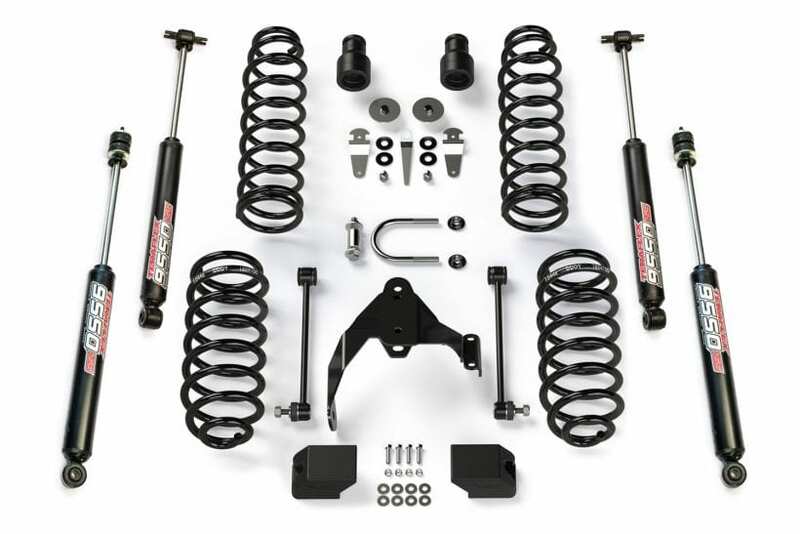 The Rough Country 3.5″ Suspension Lift Kit for the JK Wrangler is a lift kit that gives you the most bang for your buck. The only real downside to this particular lift kit is the poor installation instructions. Have you ever seen those huge, muscular guys at the gym? —you know, the ones who skip leg day? Well, if you lift your Jeep without upping the tire size, that’s what your ride will look like. Our suggestion? With a 3-3.5″ lift, don’t go larger than 33″ tires. With anything bigger than 33″, you’ll have to cut into the fender walls to create room for your new tires in order to prevent rubbing. Of course, with 33″ tires, you’re safe on the road but there may be some rubbing off-road, which is also something to consider. The BFGoodrich All-Terrain T/A KO2 tires feature an all-terrain thread type which makes for a great transition from the highway to the trails. Armored with a compound sidewall rubber thicker than its predecessor and a tear-cut-chip-resistant tread, this tire is designed to last twice as long. Speaking of fender walls, nothing beefs up your stock ride like a set of Barricade Rivet Style Fender Flares. 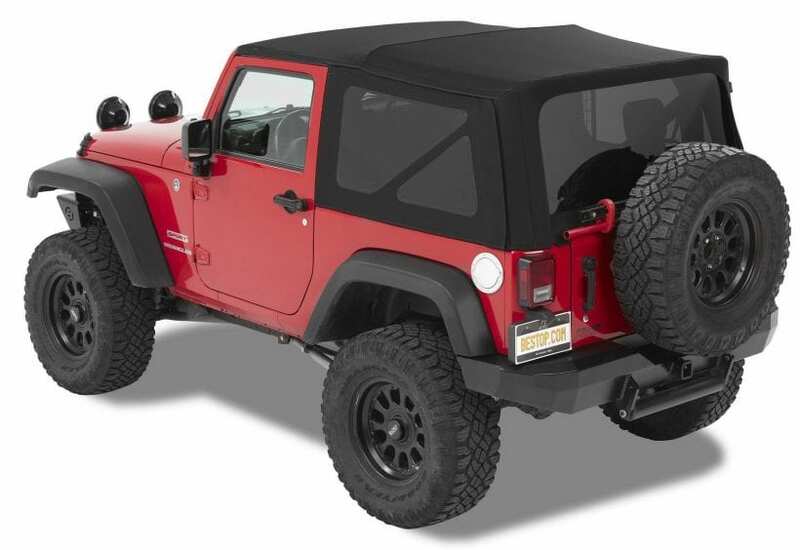 Whether you decide to lift your Jeep or leave it at stock height, after-market fender flares are great Jeep accessories. We’re not just talking about your headlights here, although upgrading them is always a good idea. 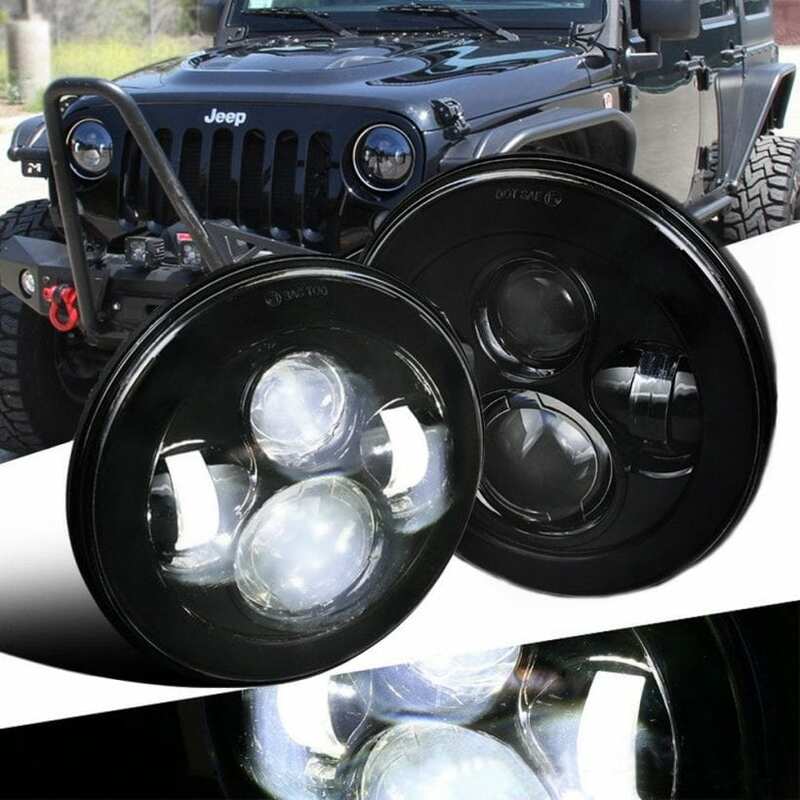 (We’re huge fans of the LX-Light 7″ Round Black Cree Led High Headlight Low). What we’re really talking about is the TURBOSll DOT light bar and fog lights. These bad boys can light up a trail or encourage other drivers to kindly move out of your way on the road. 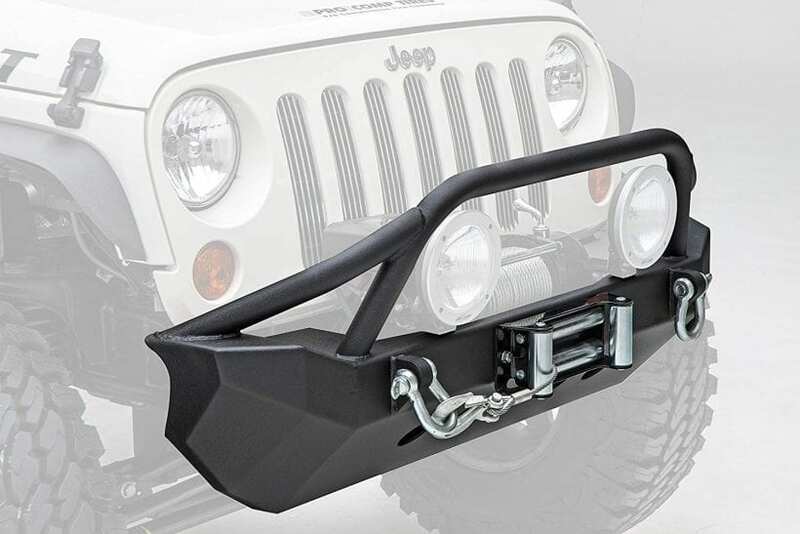 Aftermarket bumpers for Jeeps have become more of a necessity than an accessory. 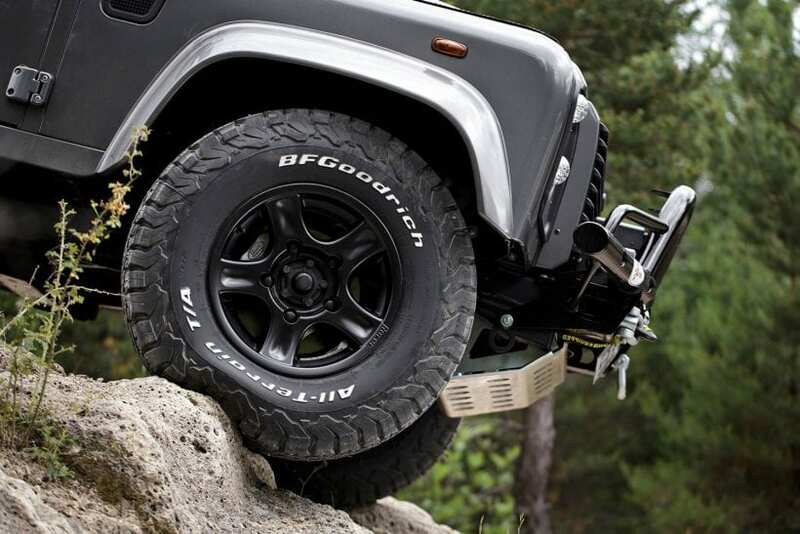 They’re built with more durable materials and they usually offer a winch mount and a grill guard. That’s total protection for your Jeep on both the trails and the road. The Smittybilt 76806 XRC front bumper offers all of that along with the capability of mounting up to a 10,000 lb winch. Speaking of winches, if you’re an offroad enthusiast, having a winch is a must. A winch can get you and your fellow offroaders to safety if the need arises. These are typically sold separately from the aftermarket bumpers and are rated by their weight capacity. You’ll want to consider the mounting capacity of your aftermarket front bumper to determine the type of winch that will fit. 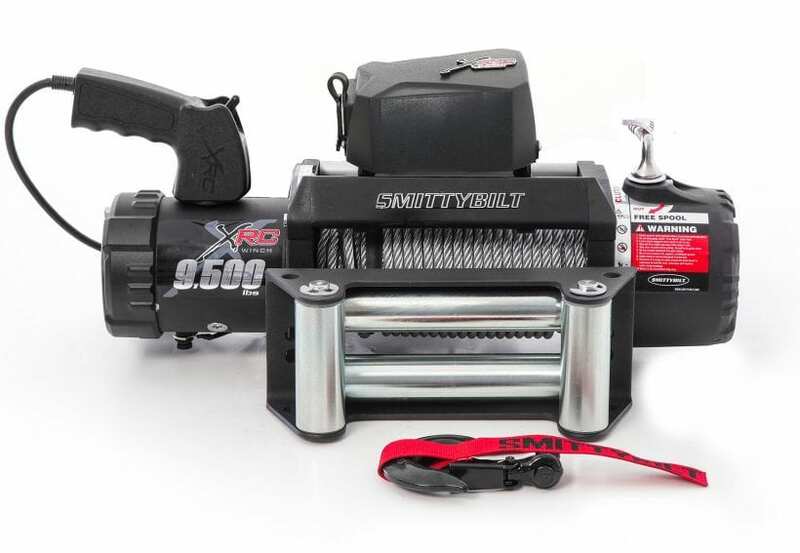 The Smittybilt 97495 XRC Winch has a 9500 lb capacity which will pair wonderfully with the aforementioned Smittybilt 76806 XRC front bumper. 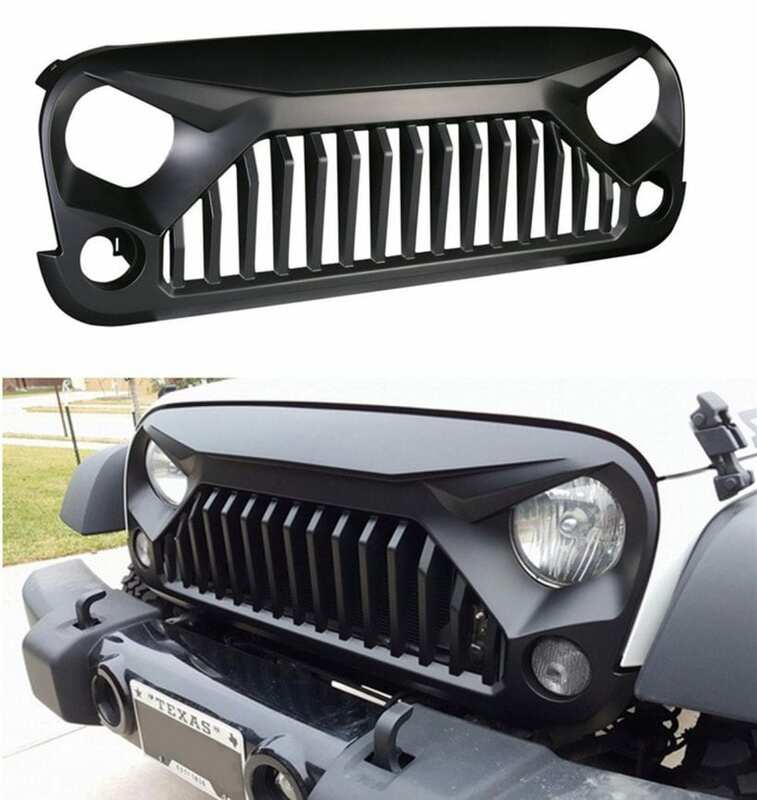 Another fan favorite Jeep Wrangler accessory is the Gladiator Vader Grille or the Opar Front Matte Black “Angry” grille. Designed to look seriously mean, this grille panel turns your headlights into two evil looking eyes and your grille slots into snarling teeth. Hence the nickname “angry” grille. Aside from its edgy look, this grille panel can fit a variety of Wranglers from 2007-2017 and installation couldn’t be easier. It’s also built lightweight but tough enough to withstand a little offroad damage. We’ve saved the best and most coveted feature of the Jeep Wrangler for last —the removable top. Whether you fancy a hard top with no doors, a soft top with no windows, a bikini top, or no top at all, these options define the adventurous spirit of the Jeep Wrangler. 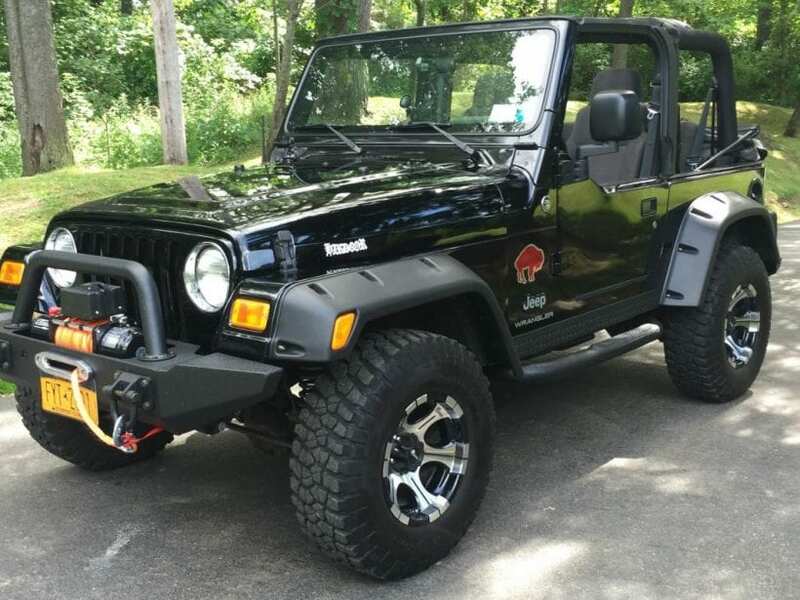 There are many brands out there which claim to make the best aftermarket soft tops for Wranglers, and there’s no doubt that they are much longer lasting than the stock vinyl soft tops. They all have their own unique designs as well as pros and cons, but one of the best on the market by far is Bestop’s Supertop NX. First of all, this soft top comes with powder coated hardware, making it resistant to rust and corrosion. Unlike other soft tops, it’s built with durability and winter weather in mind. This top also comes with 40 mm thick tinted vinyl windows and a foldable sunroof. It’s a fit for all Jeep Wrangler models, including 4-door, from 2007-2108. It’s true. Once you go down the rabbit hole of Jeep accessories and modifications, there’s no turning back. Perhaps one of the reasons that Jeeps are so loved is because you can modify them endlessly to fit your personality and lifestyle. (Plus, they’ll last a lifetime if you treat them right). If you’re a car enthusiast consider us your go-to source for the latest and popular car reviews, news, rumors, and spy shots.